It's the 29th of June 2011, day 46 of our "Cross Canada and Back" trip. The goal for the day is to drive from Dingwall, Nova Scotia, take the ferry across the Northumberland Strait to Prince Edward Island and then on to Prince Edward Island National Park in Cavendish. We break camp in heavy fog and drive the Cabot Trail, after about a half hour of driving the fog clears and we have gorgeous sunshine. There are some pretty good hills, our truck is getting a good workout both up and down those steep hills. Not a problem though, even at 13% grade. Leaving Nova Scotia..... for now. We arrived in Prince Edward Island National Park and got a great campsite with full service. We now noticed that there was something seriously wrong with one of the wheels. After some more careful inspection, we noticed that the bearings were gone and the axle was grooved.... a big mess. It was not for the lack of grease, we had greased the bearings as per manual. From what we could make out there was no cotter pin through the axle holding the nut in place or it had fallen out somehow. The bearing came loose and the rest is history. There are two RV dealers on Prince Edward Island, and one was selling Forest River products but was not set up to repair or deal with problems like ours. We got a local utility trailer manufacturer Linkletters Welding LTD to do the work. Just a fantastic company and staff. We cannot say enough good things about them. Linkletter got us going temporary so we could eventually bring the trailer to their shop, and then replace the axle once it arrived from Indiana in the USA. Our local Forest River Dealer in BC "Travelhome the RV Marketplace" really went to bat for us. They went far and beyond what we had expected. They made sure the axle got on it's way, they paid for all the repairs in Prince Edward Island. They further kept in touch with us and Linkletter to make sure it all run smoothly. Lesson learned, the most important thing when buying an RV, the dealer you buy it from. All that aside, we could not have picked a better place to have a beak-down. Wonderful beaches, friendly people, good food.... Life is good! 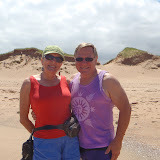 More on Prince Edward Island in our next blog. For pictures of this part of the trip see our Picasa Web Album.